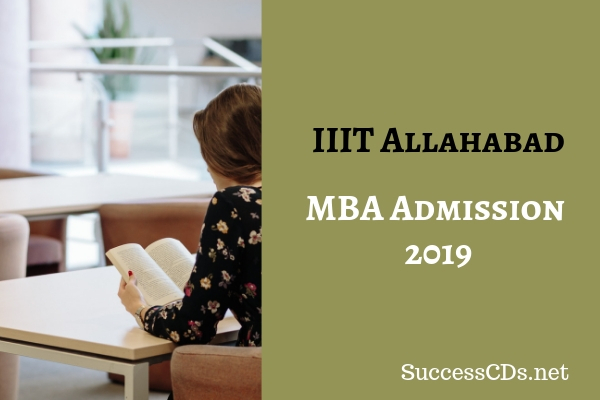 IIIT Allahabad MBA Admission 2019 - Indian Institute of Information Technology (IIIT) Allahabad invites applications for admission to 2 years full time Master of Business Administration (MBA) for the commencing session January 2019. All the eligible students can apply for IIIT Allahabad MBA Admission 2019 through the official website. Candidates should be a Bachelor’s Degree of minimum 3 years duration with minimum 50 per cent marks or equivalent CGPA (45% marks or equivalent CGPA for SC/ST Candidates. Those appearing in their final qualifying examinations and expecting their results latest by 01st July 2019 may however also apply. The information brochure along with the application form may be downloaded from the website www.iiita.ac.in. The processing fee of applications (Rs.1200/- for General and OBC & Rs.600/- for SC/ST/PH candidates) is to be paid in online mode while filling online application form. The candidates are advised to read the Information Brochure carefully before filling the application form. Students can deposit the application form fees via Debit/ Credit Card/ Net-banking etc. Scroll down to view the category-wise IIITA MBA Admission 2019 Application Form Fees.